Syrian President Bashar-al-Assad - a reformer? US Secretary of State Hillary Clinton on Sunday said the United States currently has no intention of launching a military intervention in Syria, despite its brutal crackdown that has left dozens of protesters dead. Asked on CBS television's "Face the Nation" program if Washington is planning military action similar to that launched in Libya, Clinton answered that it is not. "No, each of these situations is unique," she responded. "Certainly we deplore the violence in Syria," she said. "We call as we have on all of these governments during this period of the Arab awakening, as some have called it, to be responding to their people's needs - not to engage in violence, permit peaceful protests and begin a process of economic and political reform." She said, however, that if an international coalition, with the authority of a UN Security Council resolution, offered "universal" condemnation of Syria, military intervention would be possible. "But that is not going to happen because I don't think it is yet clear what will occur, what will unfold," she said, noting differences between Syria's suppression of protests and the crackdown in Libya. "What's been happening there the last few weeks is deeply concerning, but there's a difference between calling out aircraft and indiscriminately strafing and bombing your own cities, than police actions which frankly have exceeded the use of force that any of us would want to see," she said. Her remarks came after more than 30 people were confirmed killed in a spiral of violence that has gripped Syria since a wave of protests broke out on March 15, with demonstrators demanding reform. Meanwhile, the New York Times reported Sunday that the United States, despite historically frosty relations with Damascus, behind the scenes has been quietly reaching out to Syrian President Bashar-al-Assad urging him to stop firing on his people. The daily reports that the new US ambassador in Damascus, Robert Ford, has urged the Syrian leader to show greater restraint, as Washington tries to prevent greater upheaval in an already unstable region. In her CBS interview, Clinton was optimistic. "There is a different leader in Syria now, many of the members of Congress of both parties who have gone to Syria in recent months have said they believe he's a reformer," she said. 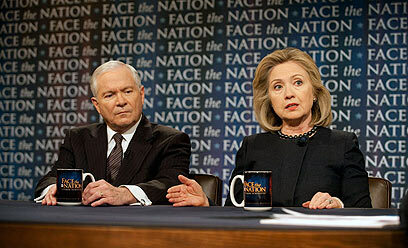 See all talkbacks "Clinton: No US military action planned on Syria for now"